Mainstreaming but with targeted initiatives are needed to include Travellers and Roma said Pavee Point Chairperson at an European Parliament Seminar in Strasbourg. Anastasia Crickley addressed the opening session of the seminar and said any response to Roma, Traveller and Sinti needs to start with acknowledging the barriers created by anti Traveller racism and its very particular form. “The agendas which have now been set through the Framework remain to be implemented in all EU member states,” said Anastasia. Anastasia noted the EU Commission representative’s concern to speak with and to the diversity of groups under what is described as the Roma umbrella. Anastasia called for solidarity between all groups experiencing racism in Europe in the interest of a more just society for all. “It is essential we acknowledge the intersection and the realities of the gendered racism experienced by Traveller, Sinti Roma women for example,” said Anastasia. The two hundred participants at the seminar, included MEPs, National Roma Contact Points (in Ireland’s case Dept Justice and Equality), Civil Society Groups, researchers and other interested people. 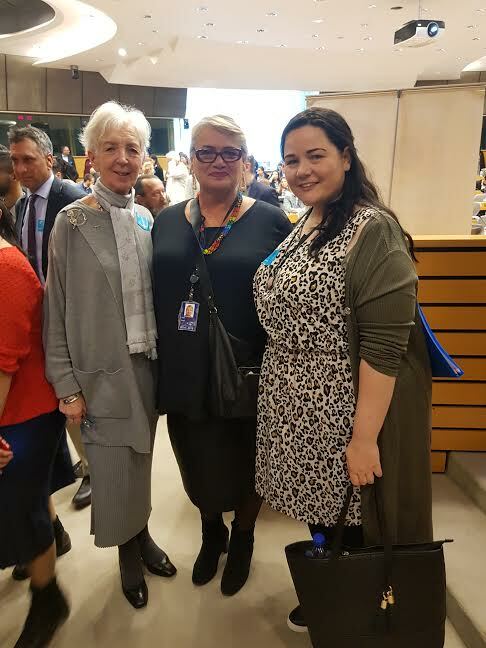 It was the first major event of Roma Week which usually takes place in the European Parliament during the first week of April to coincide with International Roma Day but was moved forward this year in view of the upcoming European Parliament elections.